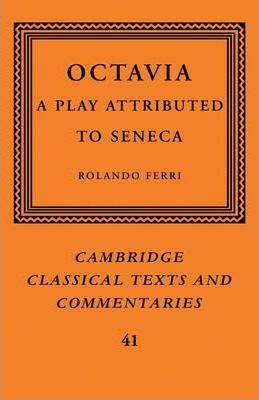 This 2003 book is a full-length study of Octauia, the only complete Roman drama of an historical subject, or fabula praetexta. The play deals with Nero's divorce from the princess Octavia, Claudius' daughter by Valeria Messalina, and with his subsequent marriage to Poppaea Sabina. Professor Ferri presents a critical edition of the text based on a fresh re-examination of the relevant manuscripts and provides a full discussion of textual issues. In the Introduction he argues that the play, wrongly ascribed to Seneca in our MSS, was composed in the late Flavian period, and that the author relied on pre-existing historical accounts written after the death of Nero. He also discusses in detail the style and language of the play, strongly influenced by Senecan tragedy, its relationship to the other plays of the Senecan corpus, and particularly to Hercules Oetaeus, its stagecraft and post-Classical dramatic conventions, and the author's political position. Review of the hardback: 'It is now Ferri's day. This book compares well with the other volumes in the Cambridge series and will need to be consulted by anyone even contemplating serious work on the Octavia.' BMCR "This is an excellent, thoroughgoing piece of scholarship." C.J. Zabrowski, Gettysburg College, Choice "F's ... commentary ... will become a standard reference source for the play.... accurate, careful, and thorough."